If you (or your landlord) have citrus trees that are unproductive due to the lack of water or care we urge you to remove them. There are a lot of citrus trees around southern California that simply are not cared for and with the ongoing drought it is likely that these trees will come back with winter rains. Now is the time to remove these trees so that they do not serve as a source of pests and disease. While residents can opt out of psyllid treatments now, they will not have this option when the disease comes along. Residential citrus trees (up to 24 trees per property) will continue to be treated by the state as long as the program continues being funded by California citrus growers. We urge you to not opt out as untreated trees serve as a source of psyllids for the rest of the Ojai Valley. Please allow state officials access to your trees so that we can keep ACP populations down. For tree removal of between 1 and 24 trees (considered non-commercial) we recommend landowners contact their preferred local arborist. Please ensure that trunks are removed or treated so that they do not re-sprout. Grind and mulch leaves and stems on-site to reduce the chance of moving any ACP. 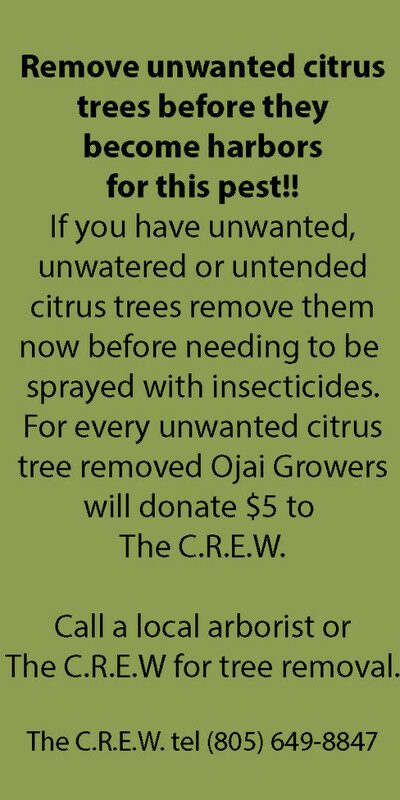 Ojai’s citrus growers have donated to The CREW (www.thecrew.org tel. 649-8847) to subsidize citrus tree removal for homeowners who are financially unable to afford tree removal. Use of these funds for low-cost tree removal will be will be made on a case-by-case basis as is up to the discretion of the CREW. Commercial growers (defined by the state as 25 trees or more) are responsible for paying for insecticide treatments of their orchards. If you have 25 or more citrus trees and are not willing to treat them with insecticides on a regular basis you should consider removing them. Sign up on their website ASAP as funding for this tree-removal program is limited! There are a group of folks asking residents to opt out of having their residential citrus trees treated for the Asian Citrus Psyllid. We ask that you consider the consequences. As local citrus growers, we urge everyone to seriously consider this matter. 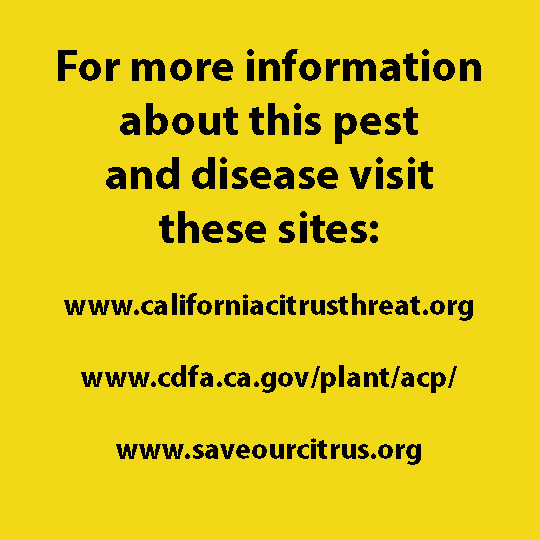 Our crops, businesses and livelihood are at stake, along with the beauty of our valley and backyard citrus trees enjoyed by all.The Asian Citrus Psyllid (ACP) is a vector of the Huanglongbing bacterial disease (HLB) which is deadly to all varieties of citrus. The only way to protect trees from HLB is to stop ACP from spreading HLB. The disease has not been detected in Ventura County, however has been found in the Glendora, Hacienda Heights and San Gabriel areas just south of us. If we can control the vector (ACP), we can control the disease.Our citrus growing neighbors in Florida are suffering greatly. Five of Ojai’s major citrus growers have gone to Florida in the past few years to study the issue first hand and research how it will affect the Ojai valley. While the citrus industry diligently searches for new ways to deal with this problem, we need continued support from the community to maintain a strong response program now. We don’t have the luxury of time to wait for potential HLB cures – our best chance now is to keep ACP populations down so the devastation in Florida doesn’t happen here.Early psyllid detections in Ojai’s east end in 2015 prompted quick response by commercial growers. We are now in a mode of area-wide treatment in order to keep populations of ACP at low levels. It has been well over 40 years since most of Ojai’s citrus growers have treated their orchards with insecticides. It is not something we do lightly, it is a huge change in the way we grow our fruit and of course quite costly. While the spray rigs looked to be pumping loads of material, the application rate is done using a lot of water and very little active ingredient. Complete coverage of the trees is essential to get to all psyllid nymphs and adults. A low rate of insecticide used is in part to protect non-target insects. Believe us when we say we do not want to disrupt the good bugs, coastal citrus growers have wonderful ecosystems of good bugs controlling the bulk of the bad bugs. We are all keeping a close eye on insect populations in our groves as we move forward.Please let State and county officials treat your citrus trees for ACP. We cannot afford to have harbors of this pest interspersed throughout our valley in residential areas. If you are unwilling to treat your trees, or have untended, unproductive citrus trees please remove them so that they do not serve as harbors for this pest. Let’s take a sensible and objective approach to this threat to our community. To claim that it is not a threat and will go away on its own if one uses the “right fertilizer” or other misguided practices does not deal with the reality of what we all face. Who are we? We are your neighbors and community members who grow high quality, local fruit and employ hundreds of local workers and generate millions of dollars of economic activity that benefit this community. We own small family farms ranging in size from 5 acres to the largest of approx. 200 acres. We are not large, absentee, corporate growers.Citrus orchards are not going to leave our valley, we are simply going to adapt to how we grow our trees and we need community support. Ojai is an agricultural valley with our infrastructure (including the water supply, Lake Casitas) and economy built on agricultural dollars. We urge you to listen to citrus growers, research scientists and state officials who have firsthand experience with growing citrus and have spent countless hours studying ACP & HLB. Linda Haque, Emily Ayala, Bill Palladini, Tony & Anne Thacher, George Thacher, James Finch, Al Stroberg, Betsy Patterson, Carly & Ernie Ford,Ben Shore, Mike Shore, Mike & Jody Cromer, Aleta London, Robert Kitteridge, Charlotte Moran,Brian Haase, Bob Davis, Roger Essick, Judy Munzig, Pat Mercer Norris, Pat & Larry Hartmann, Fritz & Margaret Menninger, Matt & Ann Inman, Jerry Conrow, Kali Coultas, Terry Coultas Wilson and Tracy Wilson. This includes growers for Friend’s Ranches, Finch Farms, Churchill Orchard, Topa Topa Ranch, Crooked Creek Ranch, The Hermitage Ranch, Friend’s Stable and Orchard, Ojai Citrus Partners, McNell Creek Ranch, Coultas Ranch, as well as growers of The Ojai Pixie Growers Association and Sunkist. SOCIAL MEDIA: Ojai Pixie Growers have joined the rest of the world on Instagram & Facebook. We’re posting news, pix and videos as the season unfolds. MAILING LIST: Sign up for our “Ojai Pixie Alert” Mailing List. We will send you an e-mail at the start of each year’s Ojai Pixie season. Sweet! (We promise not to share your e-mail address with others). © 2016 Ojai Pixie Tangerines • www.ojaipixies.com • Site designed and developed by Dogs Fly Design.